It’s already time for this month’s Eat the World Recipe challenge and holy smokes, have I been a terrible blogger! Eek! I slammed through my summer grad school class (with a A+… bam! ), then I packed the kiddoes up and put over 2,500 miles on my car and traveled through 5 states in 2 weeks! We had a blast, but it was certainly not conducive to blogging! But back to the challenge! This month’s pick, France, was chosen based off the world cup winner! After our Bastille Day round up last month, a fabulous bread caught my eye and I knew I wanted to give it a try this time around! 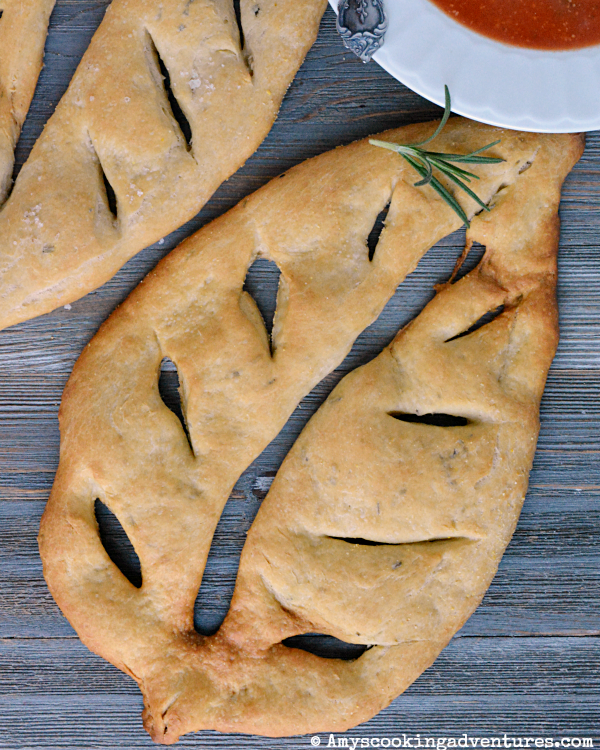 A fougasse is pretty much the French version of focaccia - the boys recognized the similarities right away (they noticed that it tasted an awful lot like Dud's Rosemary Pan Bread). The bread was both gorgeous and delicious. Since it was just me and the kids when I made this I halved the original recipe, but I really shouldn’t have since we ate it all at one meal! So feel free to double the recipe below if you’re feeding more than 3 people (or if you just really like bread)! Check out all the wonderful French dishes prepared by fellow Eat the World members and share with #eattheworld. In the bowl of a stand mixer, stir together 1/3 cup warm water, yeast and sugar. Let the mixture sit until foamy. Add the remaining ½ cup water, olive oil, flour, and salt. Mix on low with the dough hook until the dough is smooth and pulls away from the sides of the bowl. Add the rosemary and stir for another minute of so. Place the dough (it will still be quite sticky) in the greased bowl. Flip to coat the dough, then set in a warm, draft-free area and allow to rise until doubled. Stir the dough again, then cover with a kitchen towel or plastic wrap. Place in the refrigerator for 6 hours of overnight. Remove the dough from the refrigerator 1 ½ hours prior to use. Line 2 baking sheets with parchment & sprinkle with cornmeal. Divide the dough in equal halves. 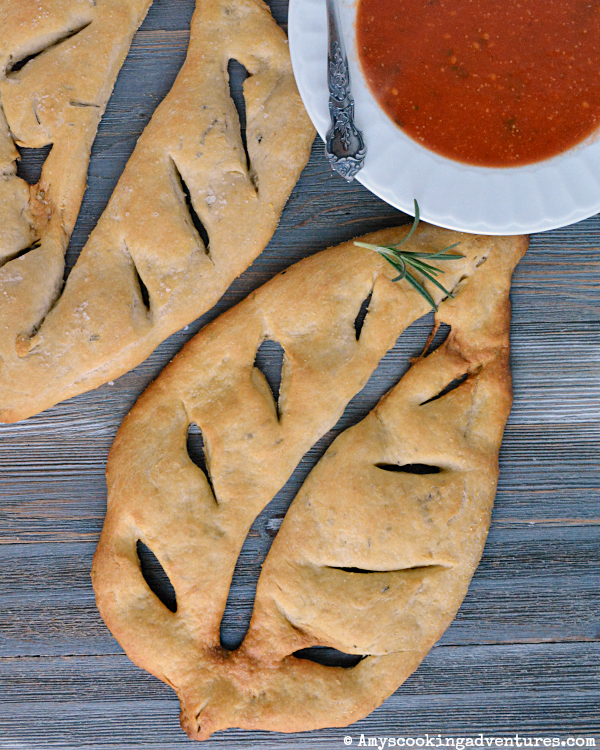 Pat or roll each dough half into a 1-inch thick teardrop shape. Place into the prepared pan. Use a sharp knife the cut slits in the bead to make it look like a leaf. Gently tug on the dough to open the slits so they don't bake back together. Brush the bread with olive oil and sprinkle with fleur de sel. Allow the bread to rest for 15 minutes. Bake in the preheated oven for 15-18 minutes or until browned. Cool slightly and serve. I love foccacia, I can't wait to try this French flat bread as well. Rosemary is such a delicious spice. 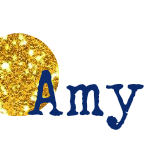 I love the look of these flat breads Amy and oh my I don't envy you all that work of putting the library back together. 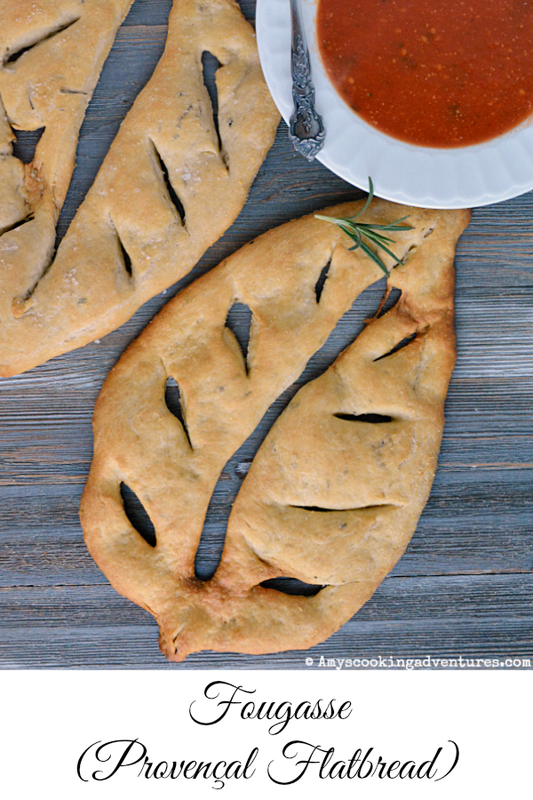 I'm so glad you were inspired by my fougasse! Yours looks fabulous! This is an inspiration! I want to try flatbread now in your lovely leaf mode, it looks delicious.